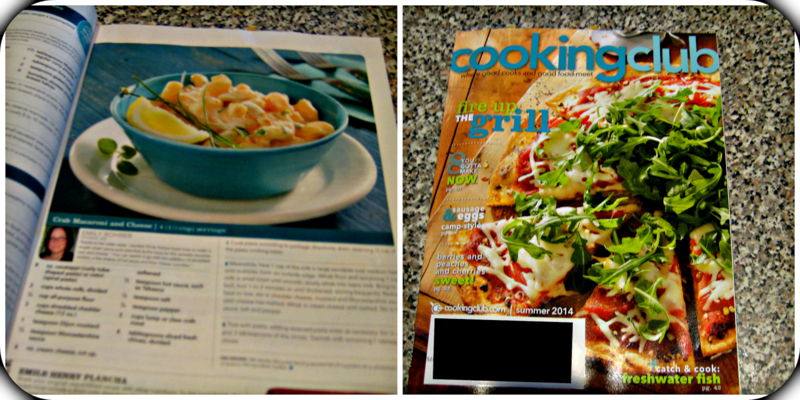 I'm pretty excited this morning...I got my copy of Cooking Club Magazine and one of my recipes has been featured! This is the first time one of my recipes has been published somewhere other than on a blog or someone's Facebook page, so I'm pretty thrilled! Growing up, my mom really didn't like to cook. She cooked because we had to eat. As soon as my sisters and I were old enough to safely handle knives and a hot stove we were put in charge of cooking a few meals every week. I didn't really get into challenging myself when it came to cooking until after I graduated from college and moved to the Eastern Shore of Maryland to be closer to my fiancé. He loves pretty much everything I cook and is always game to try new dishes, so that’s when cooking became a lot more fun for me. I hope to pass down my knowledge and love of cooking to my daughter once she’s old enough to help in the kitchen. When I think of comfort foods, mac & cheese is always at the top of my list. When I really started getting into cooking a few years ago, sauces were always a little intimidating so I still stayed away from making my own version. This year I decided to conquer my fears and really work on developing some classic sauces. Of course mac & cheese made the list of dishes I wanted to try for myself. It surprised me how simple it was to make the sauce and I've since adapted this recipe with a variety of add-ins, one even with buffalo chicken and a bleu cheese-based sauce! I think my favorite thing about recipes like this, and cooking in general, is that I can customize anything to make it my own and fit my family’s tastes.